Solid Walnut flooring offers light, medium and dark brown tones to give a classic and sophisticated appearance to this rich chocolate coloured flooring. 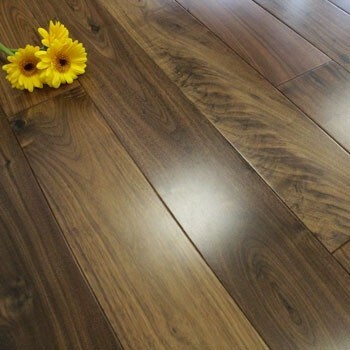 Solid Walnut flooring is made from one solid piece of walnut. It will have a tongue and groove fitting system which can be tightly fitted together to produce an elegant and gapless finish. Walnut has some distinctive knots and a unique grain pattern, which is ideal for someone who is looking for a darker floor with natural character and charm. If you would like to know more about solid wood flooring, please have a look at our Wood Flooring Guide which helps to explain the structures, profiles and different finishes of the planks of flooring. Why should I choose solid Walnut flooring? Solid Walnut flooring is a fantastic darker coloured flooring, which can give any room or space an elegant twist. It is extremely easy to look after and can last a lifetime if you look after it properly. As with all types of solid wood flooring, Walnut can be sanded down and refinished to reinstate its natural beauty and charm. After a while your Walnut floor may start to look in need of an energise. To revive its former beauty then all you need is to sand it and re-protect the surface with layers of oil or lacquer. How do I install and maintain solid Walnut flooring? As with all of our solid wood floors which have tongue and groove profiles, solid walnut will need to be fixed down to the subfloor using flexible flooring adhesive, secret nails or secret screws. The joints of the tongues and grooves will also need to be glued together to ensure and tight and gapless finish. For more advice and tips on fitting hardwood floor, see our Installation and Fitting Guide. Yes, we stock a range of solid Oak flooring profiles that will help you to add the finishing touches at any property. After your new floor has been installed, you will have small gaps and spaces around the edge of the room. We have everything you will need to cover these over, including: beading, pipe covers, thresholds, ramps and even door stops. Once your room is complete, be sure to care for and maintain your floor correctly by following our Wood Floor Maintenance and Care Guide. Yes, there are many different alternatives to solid Walnut flooring. If you are not sure about solid wood flooring and want something slightly more versatile, why not have a look at our ranges of engineered wood flooring, laminate flooring or vinyl flooring. For further advice and guidance on any of our floors, accessories or flooring products, please contact our sales office or pop into our showroom. Did you know that you can order free samples of our flooring?